It is #MeatlessMonday and I haven't posted a recipe in a while! 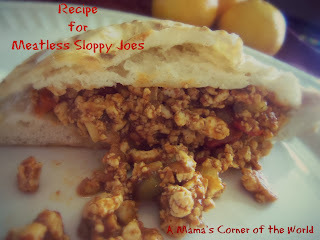 I have been in the kitchen this afternoon making my updated version of a family favorite: Meatless Sloppy Joes. My grandma was the queen of 5 ingredient meals. She only had about 8 spices in her spice cabinet and her sloppy joe recipe used 3 of them! I took my grandma's recipe and updated it a little for tonight's Meatless Sloppy Joes. Saute the Vegetables. In a 10-inch, deep skillet, add the olive oil and butter. Heat until the butter is melted and the pan is hot--but, not smoking. Add the tofu, onion, peppers, and mushrooms. Cook until the onion and peppers are nearly tender. Add the salt, pepper, 1 tsp. Chili Powder, Garlic powder, and cumin. Stir to combine and continue to cook until vegetables are tender. Make the Veggies Sloppy. Add the catsup, water, and lemon juice. Combine well and bring to a boil. Reduce heat to low, add one more teaspoon of chili powder (more or less to taste) and simmer about 20 minutes. Serve. I serve these with sweet potato fries and a salad--usually in a pita pocket. I find that my youngest daughter is far less sloppy with her sandwich mostly contained! Want to make these ahead? I almost always do. I actually like to pack up my meatless sloppy joe mixture into an airtight container and store away in the refrigerator--then reheat before serving. I think the extra time in the seasoning mix helps the vegetables take on more flavor. So--if you have the time to prepare the night before, or earlier in the day, it may add a little extra flavor boost!